A day after picking up her first win over a WTA Top 100 player Friday, a 6-3, 6-4 victory over WTA 80 and defending champion Madison Brengle, 17-year-old wild card Caty McNally got her second today, shocking WTA 57 and top seed Rebecca Peterson of Sweden 6-3, 6-3 in the semifinals of the $100,000 Dow Tennis Classic in Midland Michigan. 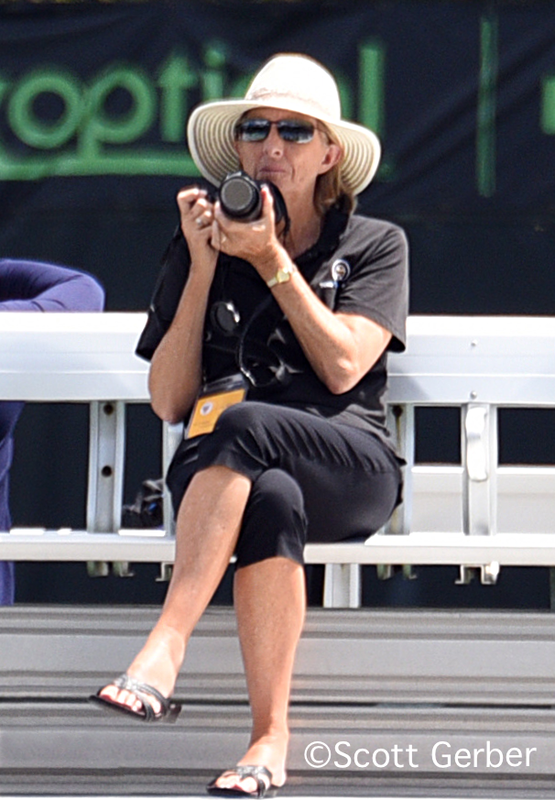 I've watched McNally for years on the biggest stages of junior tennis, and while she is by no means a hothead, she would occasionally look nervous or frustrated or angry when a match wasn't going her way. This week, the Cincinnati resident has shown none of that, with her self-possession and composure evident from her first set this week, a 6-0 drubbing of No. 7 seed Nicole Gibbs. Ken Thomas, doing the commentary on the live stream, mentioned that McNally wasn't intimidated at all by the reputation of her opponents, and that seems exactly right. She looked extremely focused on every point and never seemed to question whether she belonged in the late stages of one of the biggest Women's ITF tournaments in the United States. It's possible that her underdog status and it's resulting lack of pressure is responsible for how she approached the matches, but it seems more than that. She looks more patient now than when she was in juniors and more likely to use her impressive all-court skills at the right time. The crowd in Midland was squarely behind her in tonight's match, but she didn't let their support goad her into going for too much. She drew the most appreciation for her lob winner and her drop shot winner, but how she handled being broken for the first time in the match, in the opening game of the second set, was at least as impressive as her level of play, which was extremely high. Upset with a bad call in that first game, McNally had her only bad stretch of points, falling behind 2-0 when Peterson held at love. But McNally held for 2-1, hit three aces in one game to keep close at 3-2 and broke Peterson to even the set at 3-all. Peterson did not play well, but part of that was due to McNally's refusal to give her any easy points. Up 4-3, McNally earned two break points at 15-40, but Peterson saved them and then had two game points, which she couldn't convert. McNally showed no frustration after seeing those two break chances go by and when she got a third break point she won it easily, with Peterson missing a third-shot forehand. 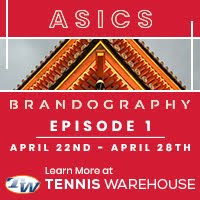 As she had done against Brengle, McNally served out the match with absolutely no drama, holding at love to complete the upset in an hour and nine minutes. McNally will face No. 4 seed Jessica Pegula, her doubles partner this week. Pegula defeated qualifier Robin Anderson 6-4, 6-2 in the afternoon semifinal. In the doubles final tonight, the unseeded team of Olgo Govortsova of Belarus and Valeria Savinykh of Russia defeated unseeded wild cards Coco Gauff and Ann Li 6-4, 6-0, winning the final nine games of the match. In addition to McNally's showing in Midland, another improbable run is going on at the ATP 90 Challenger in Cleveland, with UCLA senior Maxime Cressy advancing to the final. Cressy, a qualifier, beat No. 15 seed and former UCLA Bruin Marcos Giron 6-3, 3-6, 6-3, serving and volleying his way into his first Challenger final. Cressy will face recent Ohio State graduate Mikael Torpegaard of Denmark, who took out No. 5 seed Darian King of Barbados 6-4, 3-6, 6-3. Torpegaard, who reached the final of the Columbus Challenger last month, is 1-1 in Challenger finals, with all three of them indoors in Ohio. 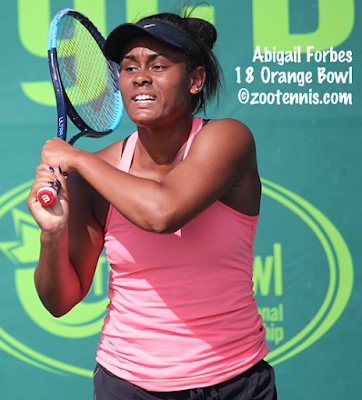 UCLA recruit Abigail Forbes won her second ITF Grade 1 singles title today in Ecuador. The No. 5 seed defeated Emma Jackson 6-2, 6-2 to extend her 2019 winning streak in ITF Grade 1 tournaments to 11 matches. She should move into the Top 50 now in the junior rankings, putting her in good position to play in the junior slams this summer. In the boys final, No. 6 seed Dali Blanch lost to No. 9 seed Flavio Cobolli of Italy 4-6, 6-2, 6-2. The non-conference dual match season is in full swing now in Division I, with several Top 20 matchups this weekend. See College Tennis Today for links to live scoring and streaming for Sunday's men's matches. For results, see the ITA ranking/results page, clicking on the Team Results on the far right of the page.